If you do some deep searching in Thai for the best Laap in Chiang Mai, few locals disagree that this little home restaurant tops the list. 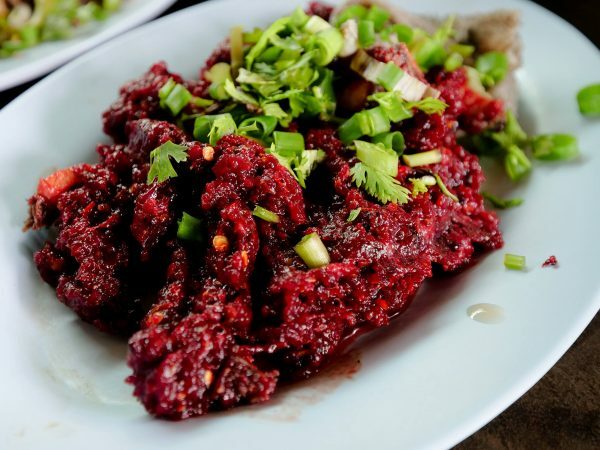 Keep reading to get all the details of this raw buffalo tartare specialty in Chiang Mai. (Jaw Drops) Oozing with creamy, cooling goodness, this is one plate you’ll want to lick clean. 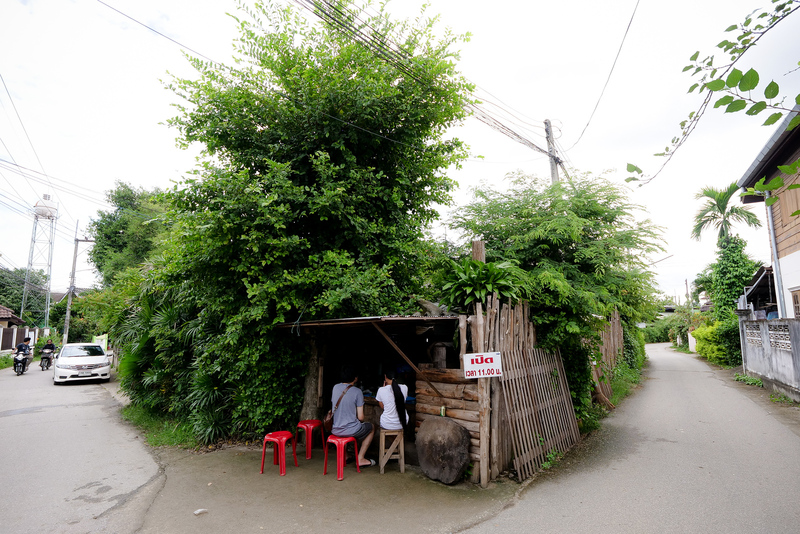 Laab Ton Koi (ลาบต้นฃ่อย) is a tiny restaurant just north east of the town of Chiang Mai. If you’ve ever had Laap then you are most likely an addict, just like I am. 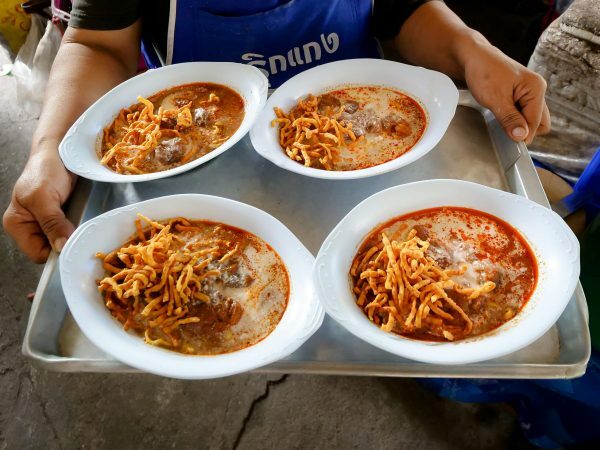 On my most recent trip to Chiang Mai, I was in the mood to search out more unique versions of this well-loved North-and-Eastern Thai local dish. I have to thank my wife Ying for discovering this place. 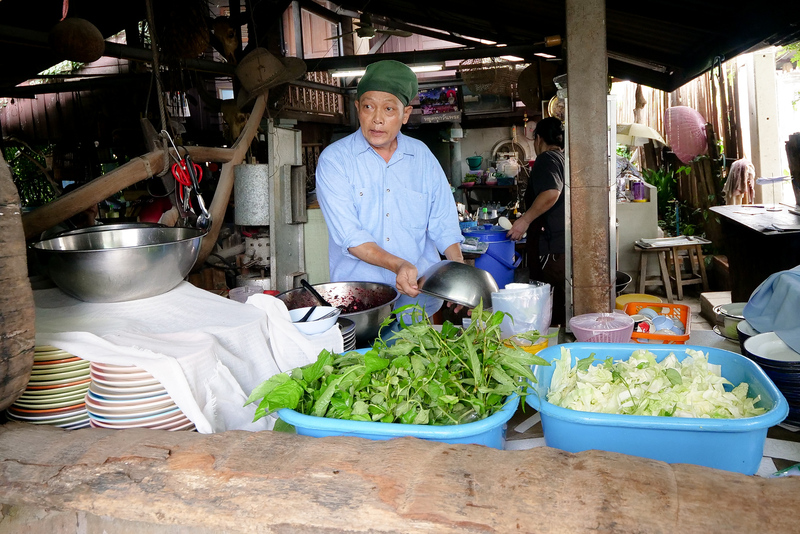 The restaurant is called Laap Ton Koi (ลาบต้นข่อย) and it opens at 11 am sharp, and stays open for as long as the day’s supply of raw, fresh ingredients hold out – which is usually only for about 3 hours or so. Be sure to get there early because showing up right at eleven, the place may already be full. I was in awe of what we had stumbled into. A few younger guys had ran past us on the street, and now I knew why. We arrived and the build-up was insane, there was literally a palpable tension in the room. The chef came out, ran out really, carrying a few huge tupperware containers of raw buffalo. Meat already minced nearly to a puree, he dumped an entire container straight into a massive stainless steel mixing bowl. Using what may have been a small boat oar in a previous life, he worked to knead in a perfected spice blend. I saw several different dry spices including Ma-Kwen peppercorns and cumin. Most importantly though, was how he adds no less than five massive ladlefuls of fresh green cow bile. It was absolutely fun just to watch him at work, hovering over his bowl, taking food craft to another level. A single batch was enough for about a dozen servings or so. Enter your email and I’ll send you the best Thai food content. There were far more than a dozen pairs of eyes watching though, each hoping to see if their table would be served first. Each bite is precious, and surroundings may tend to blur. When we were rewarded with our first plate of Laap, I couldn’t contain myself. 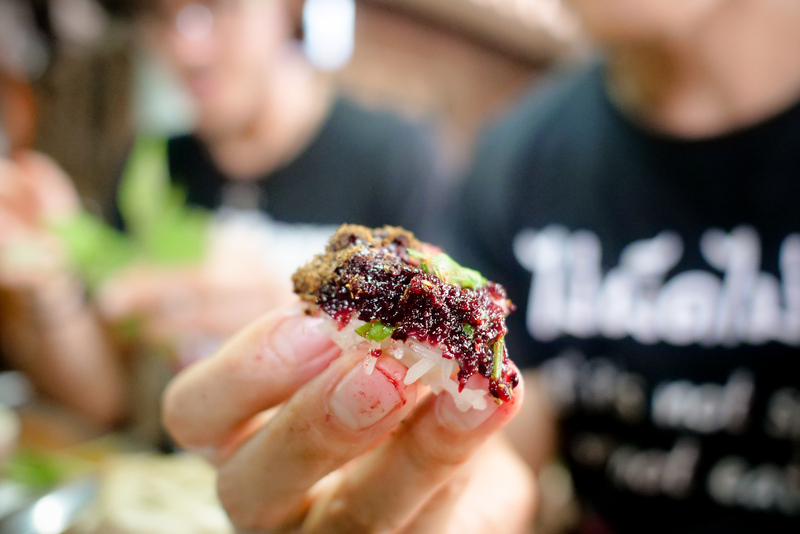 You grab some sticky rice, knead it into a small ball, and dive in for the first wonderful bite. 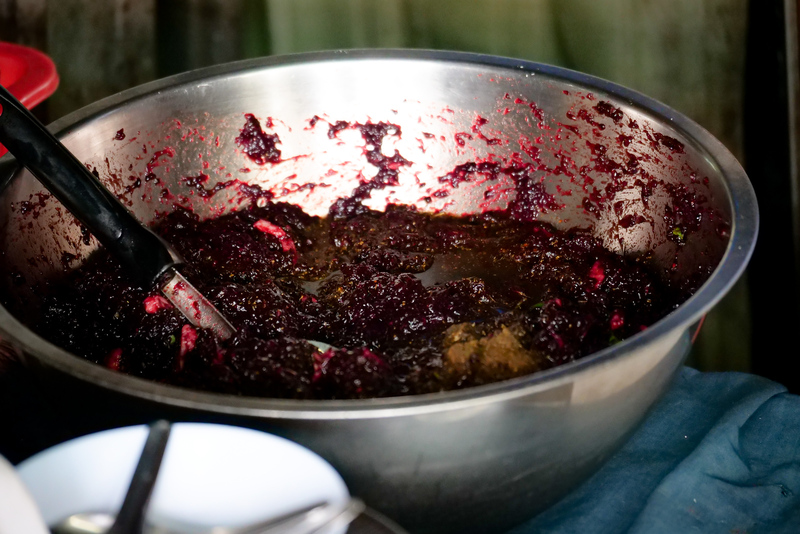 The beautiful blend of zingy herbs, bitter bile, and minced meat hits every corner of the mouth at once – it is absolutely jam packed with flavor. The digestive juices are so fresh they’re almost sweet. Next comes a small jolt in the hint of Ma-Kwen, a well-loved local ingredient similar to a Sichuan Peppercorn. In Europe one might easily be caught smearing this Strawberry-Jam like Buffalo Tartare onto toasted brown bread. Northern Thai Laap in is much different from the zesty version you will find in Isaan or the herbaceous version in Vientiane. 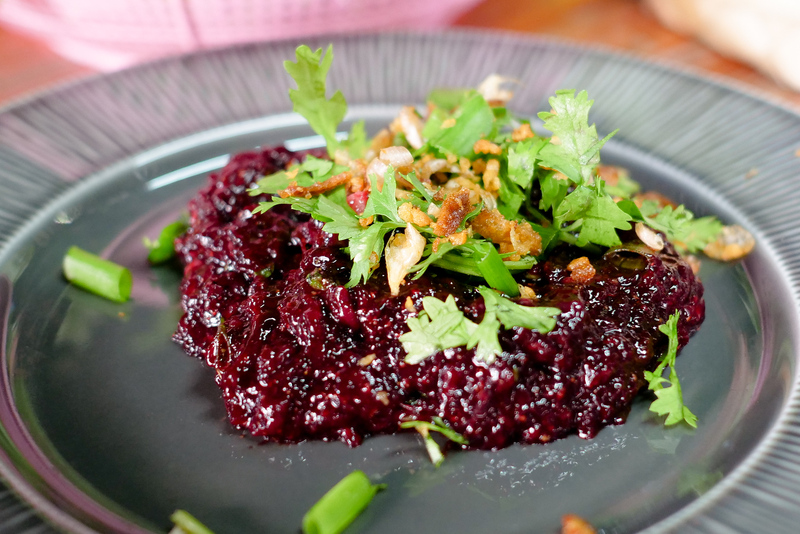 Northern style Laap is typically drier, less acidic (no lime juice), and with a dry spice blend, and doesn’t include the signature dry-roasted rice powder of Isaan Laap. The specific version you’ll have at this shop though is truly special. Among the gloriously cool, gooey feel and umami goodness, I was also crazily having thoughts of a jar of home-made preserved strawberries. It has the same consistency as jam, the same mouth-feel, and even the color is spot on as well. 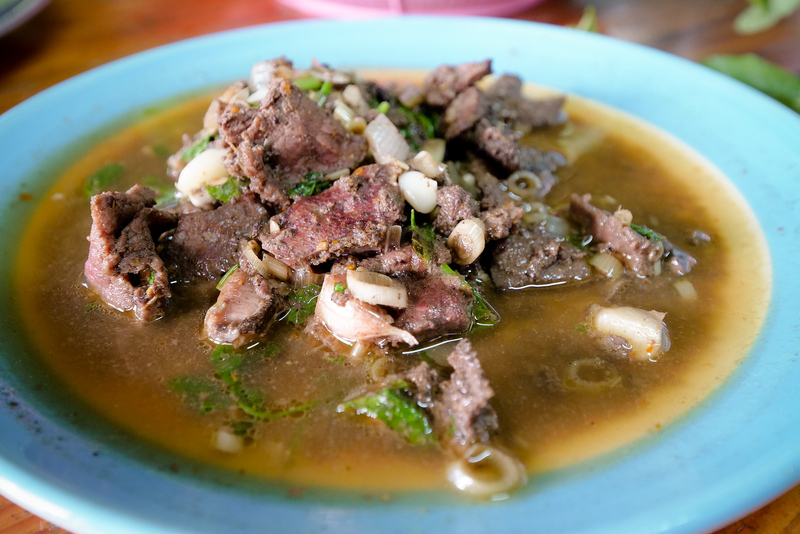 This Beef Intestine Soup (Kaeng Om) serves as a perfect pairing to go with Laab Kwai Dip. After a few fingerfuls of laap, the next thing you have to try is the Kaeng Om Moo (sometimes “Gaeng Aom Moo”). We had a few chewy bits of beef innards in ours, and for a good sixty seconds I was happily munching on what must have been a gelatinous ear. 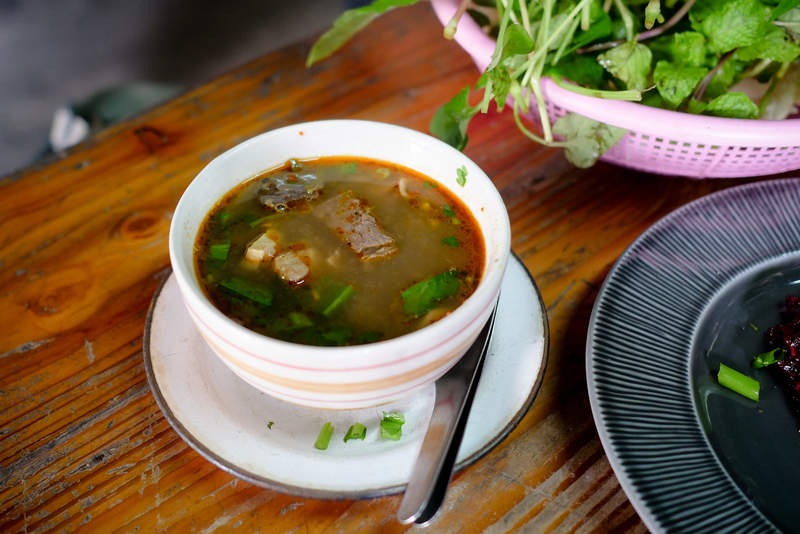 The chef’s skill shines out yet again through the Om‘s masterfully concocted herb-rich broth. I was definitely getting some back-of-the-throat tingling bile indication. Each slurp is a mouthful of warming earthy sensation. A plate of herbs also comes free with your meal. This is to use mainly as a palate cleanser, but I usually treat it like a chaser. Today it was also a sampler platter though, to learn about some new local herbs. 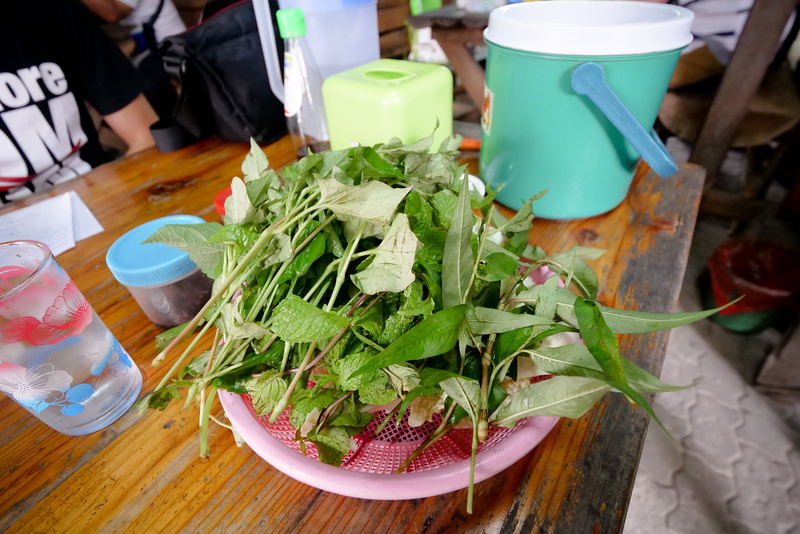 In this photo here you can see Fish Mint, Peppermint, Vietnamese Coriander, and some peppery wild Betel Leaves. The final house specialty arrives, and it’s still steaming straight from the pan. This is yet another dish with a unique and defined quick cooking time. The name literally translates to ‘jolted raw slices [of meat]’ as the meat is ever so slightly blanched. The herbaceous mix of bitter flavors combine perfectly with smooth fattiness in every piece. Our plates were again full of ‘offal’ and organs, and I was happy. Sa Sadung is a wonderful variation of Laap, blanching the meat gives it a nice chewy texture. Internal organs and skin are some ingredients that during these years in South East Asia I have grown to love, sometimes even prefer over ‘regular’ meat cuts. Richness of flavor and comforting chewy texture make these parts great additions for a filling lunchtime soup or as a night-time barbecuable delight. It is always a treat to find a restaurant so well loved by locals that the chef has absolutely nothing to prove. This restaurant confidently fulfills every one of a luncheoner’s daily raw meat dreams. If not for the unbelievably large amount of late-comers sending in orders, we could have happily eaten several rounds of all their dishes. The line here grows fast though, so make sure you come early. The menu here isn’t very big, so try not to spend valuable time searching. There are only 4 items on the hand-painted sign we saw located behind most of the tables. It must be because most guests are just ordering one of everything. Each dish cost just 40 baht (kra-tips of sticky rice for 10 baht each), which I have to say is one of the better deals on planet Earth for maximizing satisfaction against price point. 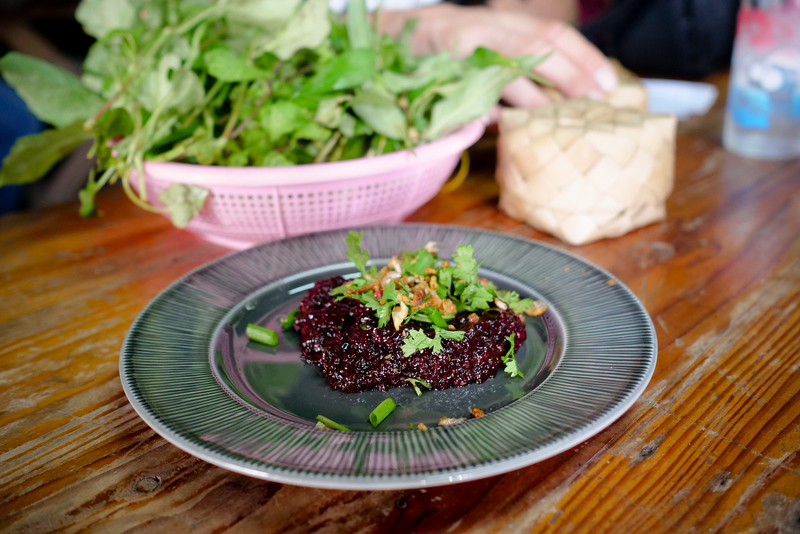 The raw dishes (Laap) are sold by the “keet,” equivalent to 100 grams. A keet is literally 1 tick on the kg scale face a market seller will use to weigh fresh market items. This measure is common throughout Thailand. 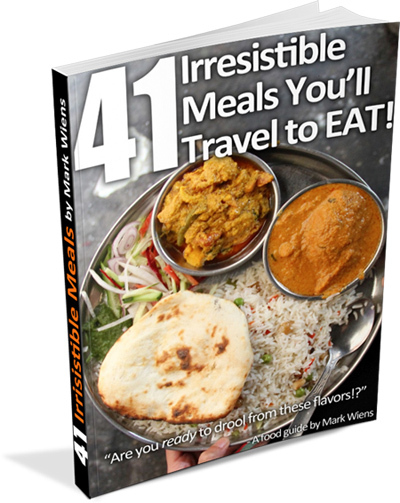 Specify an amount of each dish if you want more than 100 grams. We got the standard size without knowing it, I would love to have devoured an entire half-kilo. 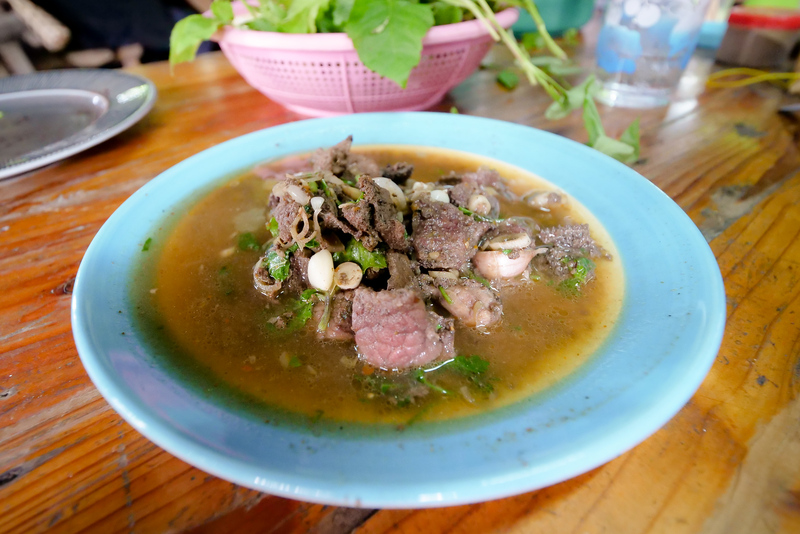 For raw buffalo, Northern Thai laap, it doesn’t get better than this. 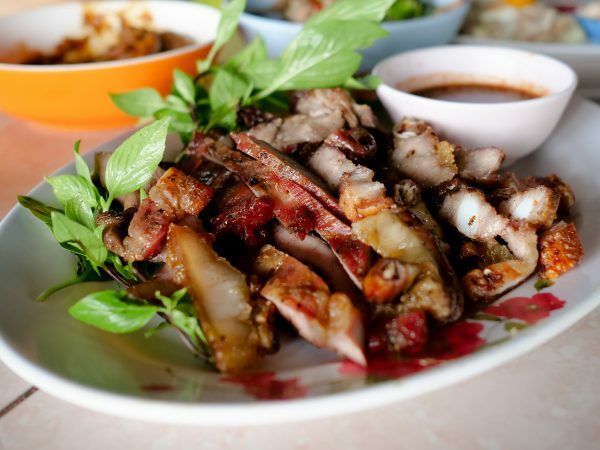 Prices: 40 Thai Baht per dish when ordering normal sizes. The plates are on the small side, but really low prices for high quality in each dish. The entrance to this small soi is on a busy street (be ready for a sharp left turn). The street was so small, most people just park on the shoulder of the main road and walk 50m or so back to the shop. The sign is small, hand-painted, and written only in Thai. Happy Munching! 1 comment. I'd love to hear from you! Hi Mark, what do you think about the dangers of eating raw buffalo? When i came back from Kumsangdao and told happily about this experience to Thai guesthouse owner he was like: you crazy? That can kill you. Parasite go to your head and you die with a few days! Me being a bit hypochondriac doesnt help either. So i tried to google more about this but it looks like those fear stories are more about pork blood and meat. Since my arrival in Thailand my stomach is already upset so it is diffuclt to know if i got sick again from this dish lol.